Warren Buffett isn’t giving up on Kraft Heinz after its $15.4bn writedown last week, but don’t expect him to buy more of its shares. "I have absolutely no intention of selling. I’ve got absolutely no intention of buying," Buffett said Monday in an interview with CNBC. He won’t buy more of the packaged-food giant "because it isn’t worth as much." Buffett played a crucial role in the formation of Kraft Heinz, teaming up with 3G Capital to help create the merger of Kraft Foods and H.J. Heinz in 2015. Buffett’s Berkshire Hathaway took a $2.7bn hit in the fourth quarter from its Kraft Heinz stake. "We overpaid for Kraft and we wrote down $15bn of that," Buffett said. "The business does not earn more just because you pay more for it." Buffett said while he thinks Kraft Heinz is a "wonderful business," he sees better places to deploy more money than buying the portion of the company he doesn’t already own. Berkshire is Kraft Heinz’s largest shareholder, with a 27% stake, according to data compiled by Bloomberg. Buffett said consumer brands’ "ability to price has changed" as more retailers such as Costco offer their own private-label goods, but doesn’t think his partners at 3G have under-invested in Kraft Heinz’s brands. He praised Jorge Paulo Lemann, a 3G founding partner, on Monday. 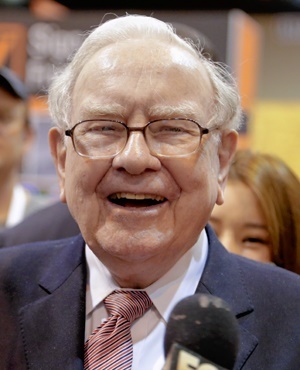 Buffett was asked about proposals from prominent Democrats, including Senator Elizabeth Warren and Representative Alexandria Ocasio-Cortez, who have advocated raising taxes on the rich. "The wealthy are definitely under-taxed relative to the general population," Buffett said. Buffett quickly changed his mind on Oracle last year, buying shares of the software company in the third quarter before selling just months later. He drew on his time investing in IBM when he decided to reverse course on Larry Ellison’s company. "Oracle is a great business, but I don’t think, particularly after my experience with IBM, I don’t think I understand exactly where the cloud is going," Buffett said Monday. Berkshire has struggled to find a massive, well-priced deal in recent years, but got close last quarter. Buffett said he was looking at a big deal late last year, which stopped him from buying more stocks as the market plunged, rounding out the S&P 500 Index’s worst year since the financial crisis. Berkshire spent only $39m in net equity purchases in the fourth quarter. "We had at least one deal possibly that would have been very large," Buffett said. "I liked stocks in the fourth quarter, but I would like buying a business even better." The deal fell through and is no longer on the table, he said. Buffett talked about the challenge of the investment landscape these days. Even his investing deputies, Todd Combs and Ted Weschler, have been having a rough time recently. The billionaire investor said both are trailing the broader market, a change from last year when they were slightly ahead of the S&P 500 in their Berkshire tenure. "Overall, they are a tiny bit behind the S&P each by just almost the same margin over the same time," Buffett said Monday. Still, Combs and Weschler, who manage about $13bn each, have done an "incredible" amount of work in terms of acquisitions and helping out on the Berkshire, Amazon.com and JPMorgan Chase & Co. health-care venture. And the pair have outperformed the Oracle of Omaha himself in recent years, he said. "They’ve done better than I have," Buffett said. Buffett clarified that the reduction of Berkshire’s Apple Inc. holding in the fourth quarter was done by an investing deputy, who trimmed the stake in order to have funds to buy shares of another company. He said Monday that he would add more Apple shares if the stock were cheaper. Berkshire spent last year piling further into financial stocks, investments that Buffett called "very good" if they’re done at sensible prices. Buffett praised Bank of America Chief Executive Officer Brian Moynihan, calling him one of the "most underestimated" bank executives in the US. Buffett also said he was dumb for not buying JPMorgan shares earlier. Berkshire disclosed a stake in the bank last year.